You have seen my Lion Egg. Now let me show you my Leopard Dog. 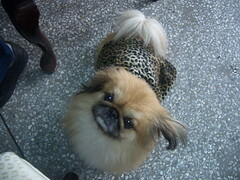 Ok Ok... so not a real leopard dog. Well, the mercury has fallen in recent weeks and we thought it's time to wrap up our doggie in warmer clothing. I took left over materials from a previous project (Leopard print shoe chair) and decided to make a few doggies shirts for him. HiaoAunty: Dog eyes black not blue. 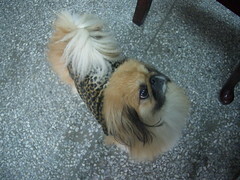 The pekingnese before this was a white one but the pet shop had to take him back coz too sickly. Nadnut: Nope. All my dogs all nice nice one.